A murder case, a sweet 16 in a mental institution, and a suicide. In the 1980’s three identical triplets took America by storm. Separated at birth in 1961, and reunited by chance, Bobby, Eddy and David were 19 when the learned of each other’s existence. After arriving at college Bobby was understandably confused when, on his first day, fellow students on campus greeted him like an old friend. After many amazed gasps, a friend of Eddy’s who had attended the university the previous semester took Bobby to meet his twin. After being the subjects of a huge news story, David recognised himself on the front page and got in touch. The plot thickened, and the triplets were reunited after 19 years. What ensued was an extraordinary period of public obsession with the twins that took them from the wildly popular Phil Donahue Show, to a cameo in Desperately Seeking Susan after being approached by Madonna in the street, as well as opening their own steakhouse in Soho, New York, called Triplets. They smoked the same cigarettes, finished each other’s sentences, dressed alike, had the same taste in women. Everyone was obsessed with their similarities, especially the triplets. After some investigative work, the triplets discovered they were all adopted from high-class New York Jewish adoption agency Louise Wise, who separated the twins and declined to tell their adoptive parents that they had siblings. At this point in the documentary the narrative turns sinister, and with it the structure of the film. What they discovered brought them crashing back to the ground at an awful speed. The three identical babies were part of a nature versus nurture experiment of incredibly questionable ethics. Intentionally separated at birth by Louise Wise, Bobby was placed with a white- collar family, Eddy with a middle-class family, and David with a blue- collar family. Each brother also had an adopted sister, all the same age, and parents who knew nothing about the multiple siblings. The point of this experiment was a study in to the concept of ‘nature versus nurture’ and the babies were regularly filmed by examiners that visited their homes and made them complete psychological testing, something that both David and Bobby remember as awkward and uncomfortable. The aim; to calculate the amount that nurture can impact the natural tendencies of a human being. Are you born a murderer and good parenting can change your destiny? Or is your fate biologically determined at conception and nothing can be done? The study was the brainchild of Austrian child psychologist and remarkably, holocaust survivor, Peter Neubauer. An unknown number of identical siblings were separated at birth and studied, unbeknownst to everyone but the studiers. 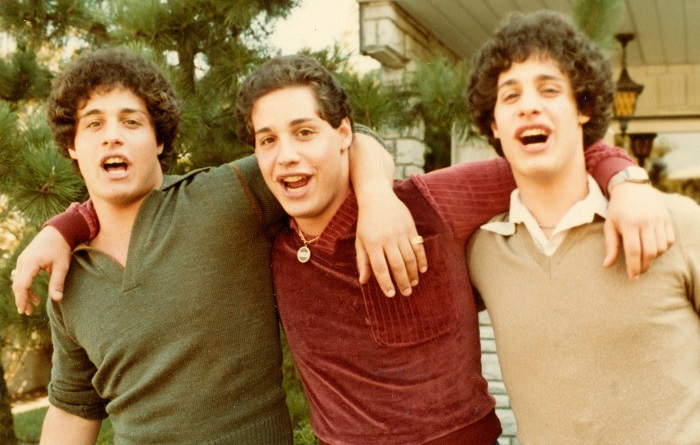 Three Identical Strangers director Tim Wardle was led to California while researching the documentary, where he interviewed Natasha Josefowitz, the now 92-year-old research assistant who contributed to Neubauer’s study, and one of the most intriguing people in this documentary. ‘You need to know, I am not part of the team. I just do the hearsay’, she starts, claiming ambiguity. What she goes on to say casts serious doubt on her lack of involvement, her familiarity with Neubauer startling and her admiration of the study obvious. ‘His background was very Freudian’, she continues. The idea that mother’s ‘want’ to give up their children is disturbing enough, and despite finding Josefowitz defiant and eccentric character endearing, her clear pride in the study and apparent lack of remorse is as disturbing as the study itself. As the study is not public it is impossible to know how many siblings still don’t know they have a twin, but allegedly two others of the siblings involved in the study are known to have taken their own lives. It is briefly mentioned in the film that both David and Bobby struggled with mental health throughout their childhoods and later lives, David mentioning that he spent his 16th birthday in a mental hospital and Bobby having to answer questions about his alleged involvement in a murder. The documentary follows an interesting narrative pattern that is in sync with the lives and revelations of the three brothers. It begins as an upbeat and astonishing story of brothers reunited in exceptional circumstances, the music, imagery and tone mirroring the boy’s elation at having found each other. Then, as the plot twists into a nightmare the style switches, creating suspense and fear through confused interviews with Eddy and David, their adoptive parents and others including one of the mysterious people sent to undertake psychological tests on the children. There are times when the documentary feels contrived, as though the film is trying to force you into shock and awe, when the story itself is enough to disturb on paper. This slightly obvious manipulation of the audience takes away from the story somewhat, and it is bizarre that the director felt as though he needed to push an already falling audience. By far the most profound and painful part of the film is the ending. In 1995 Eddy Galland committed suicide following hospitalisation for Depression. According to an article at the time, Eddy died never knowing he was part of a study. ‘I often wondered whether I didn’t teach him something. Because of the way he left, maybe I didn’t teach him something. Maybe how to live life or something. That bothers me occasionally’. The harrowing words spoken by Eddy’s elderly father, desperately exploring the idea of nurture are in direct contrast with the words from Natasha Josefowitz who claims that humans have very little control over their fates. How do we become the people we are? How much of us is genetics and how much of our personality is made up of our early life experiences is still a theoretical mystery. At the abrupt conclusion of the study in 1980, Peter Neubauer feared the public reaction to the study and never allowed it to be published. In 1990 Neubauer and the Child Development Centre of the Jewish Board of Family and Children’s Services arranged lock the records away at Yale University. The Board added further sinister mystery to the case by setting forward the terms that gave the organisation the power to approve or deny any requests to access the records until 2065. David and Bobby are now 58. Even if by some miracle they do live to 104, the Jewish Board of Family and Children’s Services have effectively eliminated the investigation. They are still fighting to overturn the terms of privacy. 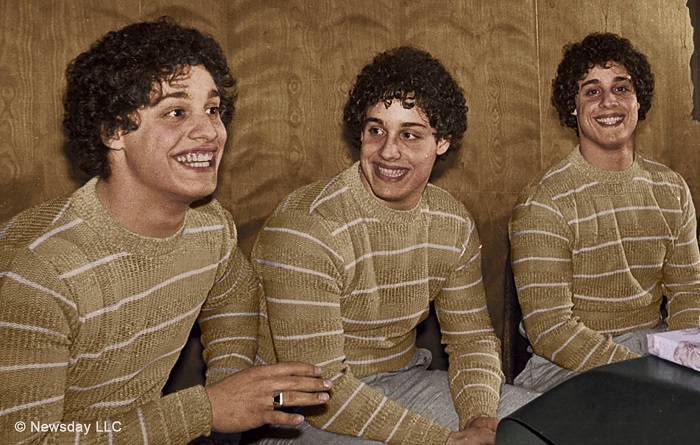 Three Identical Strangers is undoubtedly one of the most intriguing documentaries of recent years. If this amazing story has left you wanting more, I can highly recommend The Path of Blood, a 2018 documentary sourced from hours of Al Qaeda footage captured by Saudi Arabian security services during their conflict between 2003 and 2009. Nae Pasaran is another fascinating watch, documenting the heroic behaviour of Scottish factory workers in 1974, when they refused to fix the Chilean Air Force Jet in protest against the recent military coup of the tyrannous General Pinochet.